Regardless of how you interpret the not-guilty verdict in the Zimmerman trial, all Americans should be concerned about the Federal Government launching a civil hate-crimes case against George Zimmerman. The Constitution provides protection against “Double Jeopardy”. It is in the best interest of all Americans to make sure our rights in this regard are protected. Even if it means all owing an injustice to prevail, it is critical that the federal government not be allowed to drag a defendant though repetitive trials. 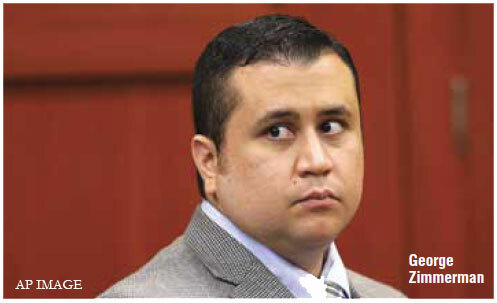 If Zimmerman can be indicted twice for the same crime, where does it end? Theoretically, he could be charged every time someone were to come forward with “new evidence” and he would have to live out his days in fear of a government indictment for an issue already resolved by a jury of his peers. Now, forget we are talking about George Zimmerman. Put yourself into his shoes, because once the precedent is set, we will all be subject to similar prosecutorial irregularities. Let’s review the major milestones of the case and then summarize the threat to our Constitution. George Zimmerman, a 28 year old Hispanic neighborhood watch coordinator within a gated community in Sanford Florida, had an altercation with Trayvon Martin, a 17 year old black high school student who was residing within that community. The altercation occurred on February 26, 2012 and ultimately resulted in a lethal use of force. Mr. Zimmerman discharged his weapon amidst the struggle which had ensued and Trayvon Martin was mortally wounded. On March 12, 2012, Police Chief Bill Lee turned the investigation over to the State Attorney’s office for review. He stated that Zimmerman had alleged self-defense and that unless probable cause could be shown to dispute that statement, the state had no cause for arrest. On March 13, 2012, Chris Serino, the lead investigator, filed a capias request, recommending that the State charge Zimmerman with negligent manslaughter, although he was doubtful that sufficient evidence existed to prosecute. Apparently both law enforcement officer’s opinion was confirmed by the State Attorney’s Office as they did not file any charges at that time. On March 20, 2012, State Attorney, Norm Wolfinger declared his intention to convene a grand-jury on April 10th to investigate and decide if an indictment should be handed down. Simultaneously, the Justice Department opened a Civil Rights investigation. Meanwhile, Governor Rick Scott, asked the Florida Department of Law Enforcement to investigate. On, March 22, 2012, Governor Rick Scott assigned State Attorney Angela Corey to the case. She promptly decided that her office would decide whether or not to press charges stating, “I always lean towards moving forward without needing the grand jury in a case like this, I foresee us being able to make a decision, and move on it on our own.” On April 11th, George Zimmerman was charged with 2nd degree murder. On July 13, 2013, the jury found the defendant not guilty. According to CNN’s, State of the Union, broadcast last week, The National Association for the Advancement of Colored People are pushing for federal action. Ben Jealous, President of the NAACP, is pushing for US Attorney General Eric Holder to pursue a hate crimes charge against Mr. Zimmerman. The Congress shall have the power… To provide for the punishment of counterfeiting the securities and current coin of the United States. The Congress shall have the power… To define and punish piracies and felonies committed on the high seas, and offences against the law of nations. Treason against the United States shall consist only in levying war against them, or in adhering to their enemies, giving them aid and comfort. In summary, all laws that seek to create federal crime out of certain behavior not associated with counterfeiting, piracy or Treason are unconstitutional. The “law of nations” refers to laws governing the acceptable treatment of one nation regarding another so that clause would not apply to the actions of the civilian population. Even the impeachment power of the Federal Government holds no criminal authority. Impeachment is simply a governmental procedure for removing a member from government. Any criminal proceedings associated with an impeachment are handled by the appropriate authorities, and are sometimes but not necessarily a federal criminal case. Therefore, it is an abuse of power for the federal government to classify a whole host of new federal crimes including hate crimes. These suggested laws should be considered at the State level. Threat #1: There is no justification for the Federal Government to assume original jurisdiction with regard to an act of violence committed by one citizen against another within the boundaries of a state. Threat #2: In the Trayvon Martin case, an indictment of a grand jury was never handed down. No person shall be held to answer for a capital, or otherwise infamous crime, unless on a presentment or indictment of a Grand Jury … nor shall any person be subject for the same offense to be twice put in jeopardy of life or limb.